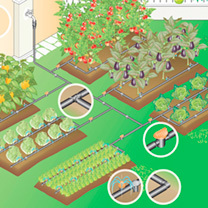 Provides precision watering for up to 60 separate plants - simply attach to an outdoor tap. Each dripper or shrubbler can be adjusted to enable complete water use management, and they can be taken apart and cleaned out if they should ever happen to become blocked up. The shut-off valves will enable certain parts of the system to be shut off for maintenance or reduced irrigation. Ideal for use with a timer (not included). Kit can be extended with additional components. All components are covered by the manufacturer's 2 year warranty.